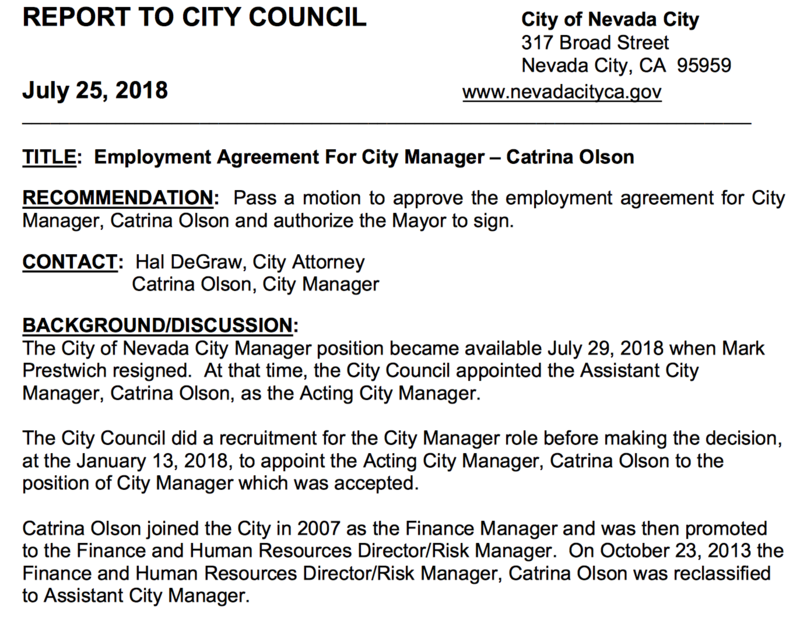 The latest City of Nevada City Manager, Catrina Olson, will earn a base salary of $115,000 per year plus generous benefits, according to an employment contract. Olson joined the city (pop. about 3,000) in 2007 as finance manager and has since been promoted to other positions including assistant city manager (as of October 2013). The city manager’s position has turned over several times since then. This is Olson’s first job as a city manager (her predecessors were more experienced in city government), and it comes at a challenging time for the city. The contract is a consent agenda item at the Council’s this Wednesday’s council meeting. That means there will be no separate discussion of the item — including the rationale for the figures in the contract — unless members of the Council, staff or the public request that it be removed from the consent calendar for separate discussion. The term of the agreement is from January 10, 2018, until June 30, 2023. “The City of Nevada City Manager position became available July 29, 2018 (sic) when Mark Prestwich resigned,” a memo to the Council (see below) said. “At that time, the City Council appointed the Assistant City Manager, Catrina Olson, as the Acting City Manager.” (Most of us thought Prestwich resigned in 2017, not 2018, so that should be cleared up). Other benefits include four weeks of paid vacation per year; 14 holidays per year; 80 hours of administrative leave per year; one day per month of sick leave; health insurance; life insurance; allowance for automobiles and cell — and retirement perks. Council meeting on our computers. What a disappointment! Defensive and insecure. Catrina is not a professional planner yet she commands this professional salary? She’s basically learning on the job and who’s doing the teaching? Hal? Catrina is the city manager and Amy is the city planner, but this is Catrina’s first job as the full-time city manager. She was the assistant city manager. To me, at least, the starting salary in this role (base pay of $115K plus all the benefits) is high, given her experience, a low inflation rate, and compared to the starting salaries of previous, more experienced city managers (Prestwich, Albaugh, and Brennan). A more prudent management practice (especially given runaway costs for small cities like ours) would have been to give Catrina a nice raise after reaching goals at the one-year mark — a common practice. Hal is a part-time lawyer with a Roseville outfit that farms out lawyers to cities. He used to work for the County as a land-use lawyer. He has been a snide and dismissive lawyer to our neighbors regarding valid concerns about the height of a “granny unit,” as well as my simple request to discuss the rationale for the city manager’s salary in a public meeting, instead of automatically approving it on a consent calendar — again, a standard practice. If you watch the meetings, you tend to notice a generally snide and dismissive attitude that creeps into the discussion by certain staff members and Council members. Public service can be a thankless job, to be sure, but some of the folks at the table sound burned out from public service. I’m excited about Erin Minett joining the Council. I voted for Erin and Duane this time around — now feeling better about the former than the latter. So it goes.